Magnesium is the eighth most common element in the universe and the Earth's crust. It has a wide range of uses in industry and is also an important element in medicines. It is often used as an alloy with aluminum; the addition of magnesium lightens the weight of aluminum without negatively impacting its mechanical, fabrication and welding characteristics. Magnesium is also used in pyrotechnics and can help to soothe upset stomachs. Despite the fact that it is easy to find, magnesium is never found free in nature. As a result, many different methods have been developed to separate magnesium from other substances. Depending upon the location and type of resource being used, a wide variety of production methods can be used to refine magnesium metal. This is due to two factors. First, magnesium is very abundant, making production in many locations possible. Second, its end-use applications are price sensitive, which to encourages buyers to constantly seek the lowest possible cost source. Electrochemical processes are used to extract the metal from dolomite and magnesite ore. 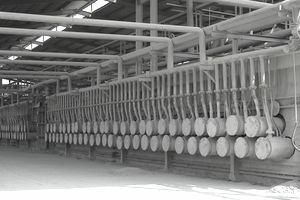 When dolomite is crushed, roasted and mixed with seawater in large tanks, magnesium hydroxide settles to the bottom. Heating, mixing in coke, and reacting with chlorine, then produces molten magnesium chloride. This can be electrolyzed, releasing magnesium, which floats to the surface. Salt water can also have a high magnesium content. The first magnesium metal extracted from sea-water was produced by Dow Chemicals at their Freeport, Texas plant in 1948. The Freeport facility operated until 1998, but, presently, the only remaining salt water magnesium producer is the Dead Sea Magnesium Ltd. (Israel)—a joint venture between Israel Chemicals Ltd. and Volkswagen AG. In this process, closed-end, nickel-chromium-steel alloy retorts are filled with a mixture of calcined dolomite ore and ferrosilicon, which are heated until magnesium crowns form. Each cycle takes about 11 hours, requires manually filling and emptying of the vacuum tubes, and uses about 11 tons of raw materials for every one ton of magnesium produced. The reason for the extensive use of the Pidgeon Process is due to the shift in production to the coal-rich provinces in north-central China where labor and energy costs are significantly lower than in other magnesium producing regions. According to Magnesium.com, in 1992, China produced only 7,388 tons of magnesium. By 2010, this number was estimated to be 800,000 tons or more than 85% of global production. Many countries besides China do still produce magnesium, including Russia, Israel, Kazakhstan, and Canada. However, annual production in each of these countries is less than 40,000 tons.